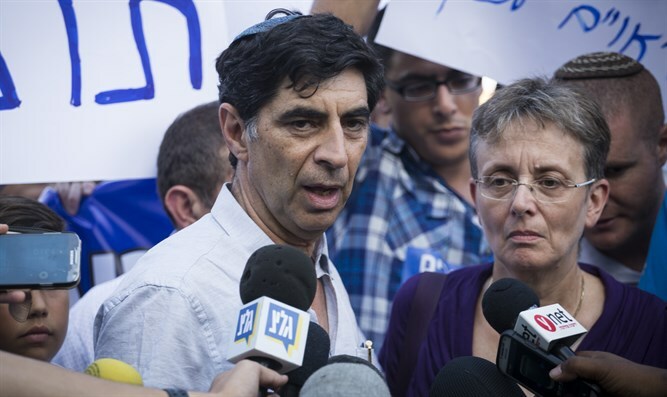 Hadar Goldin's mother criticized government policy: How can you pressure Hamas when you simultaneously give them "deluxe" conditions? Leah Goldin, the mother of Hadar Goldin who was killed in Operation Protective Edge and whose body is being held by Hamas terrorists in Gaza, criticized the government's lax attitude towards Hamas, evidenced by its policy of huge humanitarian aid packages to Gaza and the outstanding conditions Hamas terrorists receive in jail. "Just this week, salaries were paid out to people in Gaza, every day 1,000 [aid] trucks enter Gaza. The same people giving Hamas prisoners deluxe conditions in jail are the ones negotiating with Hamas. The same people letting Gazan families visit their terrorist relatives every week are the ones negotiating with Hamas. "We can't get caught up in the concept of 'the price of freeing terrorists' because that's [the whole heart of the problem]." Regarding the Shalit deal, Goldin said, "We as a family didn't like the idea at all because it was a complete surrender on the part of the State of Israel to the extortion of Hamas." MK Nissan Slomiansky (Jewish Home) suggested various kinds of pressure that could coerce Hamas into returning the bodies without negotiations. Two days ago, Defense Minister Liberman had indicated in private conversations that he would not negotiate with Hamas in exchange for the bodies of fallen soldiers Hadar Goldin and Oron Shaul. "By my estimation, the bodies of the soldiers will not be returned to Israel, I don't see it happening. I was also against the Shalit deal in the past, and I don't intend to cut a deal with Hamas in the future," the Defense Minister said, according to Channel 10. Yesterday, Chairman of the Opposition Yitzchak Herzog criticized Liberman's statements, saying: "We're dealing with a cruel enemy. I suggest the Defense Minister stop talking, whether publicly or privately. Returning our boys home has been an order since the State's founding. We need to stop selling delusions, to know how to see reality and stop hurting families."